With some careful consideration of DDOT’s proposed streetcar system, we suggest one alteration regarding the Rhode Island Avenue route. 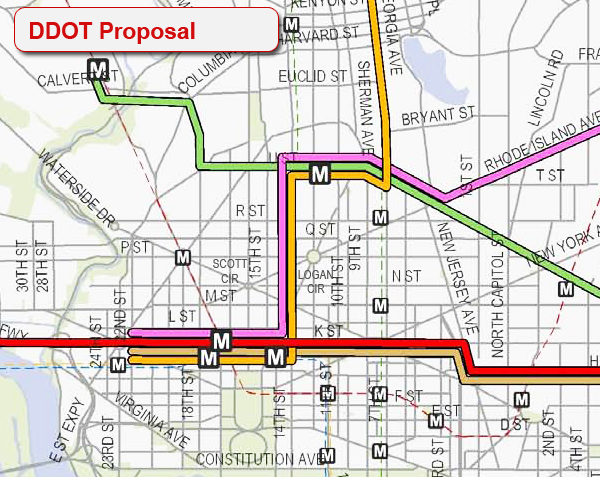 DDOT would prefer to run the purple route all the way down Rhode Island Avenue from P.G. County to Florida Avenue (at the edge of LeDroit Park), at which point it would follow Florida Avenue northwest to U Street, then down 14th Street to K Street. We suggest that DDOT study placing the route entirely along Rhode Island Avenue all the way to downtown. Rhode Island Avenue empties out onto M Street, which the route would follow onto New Hampshire Avenue and then to Washington Circle in Foggy Bottom, where it could turn back. It’s more intuitive. Rather than zig-zagging from Rhode Island Avenue to Florida Avenue to U Street then to 14th Street, then to K Street, the proposed route would simply follow Rhode Island Avenue all the way downtown. In fact, the route would become synonymous with the avenue, which is well known in the city and P.G. County as one of the main arteries. Riders familiar with the city but unfamiliar with the map will know exactly where the line goes. It avoids congestion on Florida Avenue. The 400, 500, and 600 blocks of Florida Avenue NW, on the edge of LeDroit Park, are frequently congested even during non-rush hour periods. Avoiding this section of road will reduce delays on the line. It’s more direct. DDOT’s route would take inbound passengers southwest along Rhode Island Avenue, and then northwest at Florida Avenue. Our alignment cuts the distance from LeDroit Park to Washington Circle by 29% (2.0 miles versus 2.8 miles). It’s more central to Shaw. The proposed route passes closer to the center of the Shaw neighborhood and passes by the Metrorail station entrance at 7th Street and R Street on Rhode Island Avenue. DDOT’s alignment passes on the edge of Shaw and two blocks from the Metrorail entrance. It provides more redundancy downtown. In the event of a closure of the K Street Transitway (for an accident, vehicle breakdown, street protest, etc.) anywhere from Washington Circle to 14th Street, the proposed route provides a parallel set of tracks just a few blocks away allowing a quick diversion around the trouble spot. This proposal will not reduce coverage at all, since the route we suggest eliminating is already covered by at least one other proposed line. The map below illustrates the difference. 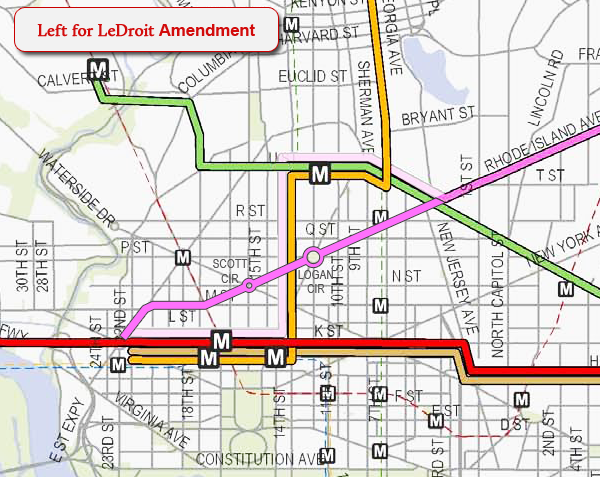 Click the buttons to switch between the DDOT proposal and the DDOT proposal with our amendment. Download an image of our proposal. Like the idea. Possibly one of the reasons why your plan might not work is due to the circles, e.g. Logan Circle, being obstacles. I don’t know much about rail construction, but imagine it isn’t as cost effective to have obstacles like that. I did see the lines near completion on H Street NE. I really can’t wait for R.I. Ave to get a line!